Lake Powell, the largest reservoir for Colorado and other Upper Basin states, is 26 feet below its level compared with the same time last year. 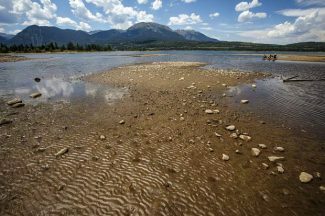 Due to terrible snowpack, more water is going out of the reservoir at this point of the year than flowing in for the first time since 2013. That’s where we might see silver linings under lots of clouds on the horizon. The federal Climate Prediction Center is calling for above-average precipitation from July through September. However, that heavy rain doesn’t seem to have kicked in yet, and the coming weeks and months will be critical to help alleviate a slow-motion crisis.